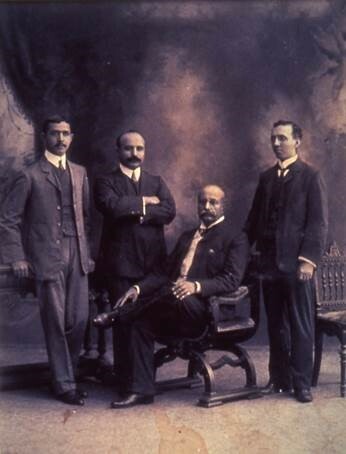 Singapore’s Raffles Hotel has became famous the world over thanks to four Armenian entrepreneurs: brothers Martin, Tigran, Aviet and Arshak Sarkies, who were able to provide rich Europeans traveling to Asia with familiar comforts amidst the exuberance of Equatorial jungle. One can still find this oasis of low-rise, white-walled houses in the very center of Singapore, amid skyscrapers and extravagant buildings made of metal and glass. High arcades that connect the houses create a labyrinth made up of enclosed patios, where palm trees provide the guests with shade. To this day, the historical hotel’s main entrance is located on Beach Road. This busy motorway used to be a quiet street running along the seashore. The shore was moved several hundred yards into the sea a long time ago, as Singapore continues battling for land with surrounding waters. Land plots that were wrestled away from the sea have been used to create a new Botanical garden, museums and walkways. But Raffles Hotel perseveres in its original location, though it is no longer just a hotel. At the end of the 19th century it became famous for its excellent service and hospitality, and today it stands as a testament and an eyewitness to Singapore’s almost two-century-long history. It brings together memories of colonial English prejudices and the shrewdness of Armenian businessmen, the affinity that the first well-off European tourists had for exotic travel and the special atmosphere so welcomed by English writers and poets. 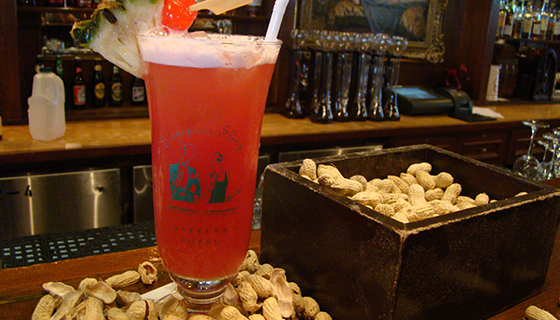 It was at the hotel’s Long Bar — the principal meeting spot for 19th and 20th century expats — that bartender Ngiam Tong Boon invented the Singapore Sling cocktail, which, along with the Raffles Hotel itself, have long become part of Singapore’s national heritage. Somerset Maugham, who often stayed at the hotel for long stretches of time, likely tasted the cocktail, though its original recipe was lost. Maugham once wrote that “Raffles stands for all the fables of the exotic East!” The hotel became a refuge where the writer could go to work on his prose, and his words served as an excellent advertisement that attracted new guests. The Armenian diaspora came to Singapore following Sir Stamford Raffles, one of the founding fathers of the British Empire who landed on the island with his expedition in 1819 and established a colony there. Records indicate that the first Armenian merchants settled in Singapore as early as in 1820. The group of settlers included some members of the Sarkies family, and in just a few years Aristarkies and Aratun Sarkies came to own the majority of Singapore’s commercial enterprises. Armenians came here from the Iranian city of Isfahan and from India. They had already succeeded at trade, but, with its exceptionally fortunate location at the crossroads of all Southeast Asian routes, Singapore held a special promise of even bigger rewards. The local diaspora has always been small but prosperous, and has left a notable mark on the city landscape. In today’s Singapore you can still find the Armenian Street, or Sarkies Street, as well as numerous buildings that belonged to Armenian businessmen of the colonial era. In the old part of the city one can find Singapore’s first Christian church — the Armenian Church of St. Gregory the Illuminator — that was also a technological wonder of its times. Completed in 1835, the church became Singapore’s first building to be electrified. By the time the Sarkies brothers began considering Singapore as their next business venture they already had several years of experience in successfully managing a luxury hotel at Malaysia’s Penang. In 1887 Tigran, who was considered an “astute and decisive person,” opened a small Raffles Hotel in the name of all the Sarkies brothers. The hotel originally consisted of just ten bungalow rooms but began expanding quickly, and Tigran’s younger brothers started taking an active part in the management process. Just a few of years later they opened two new spacious wings with 22 rooms, complete with terraces and a sea view. Shortly after they opened the so-called “Palm Court,” with 30 additional rooms with verandas. It was here, in the more secluded part of the hotel, that writers, including Maugham, liked to stay and work. In the beginning of the 20th century the hotel acquired another two-storied wing, the ground floor housing Singapore’s first shopping center and the second floor given over to the rooms. Raffles Hotel was popular with travelers not only because it was hard to find a decent hotel adhering to European standards in all of Southeast Asia, but also because the Sarkies brothers turned out to be excellent marketers. While they weren’t professional hoteliers, they were generous and sensible businessmen who also had an eye for luxury. The brothers offered their guests a new interpretation of comfort and service: they sent limos to pick up prospective guests at the port, offered them tours around the city and strove to provide them with any assistance necessary in a new and unfamiliar place. Of course, a lot depended on the rooms themselves. At Raffles the rooms had electricity from the hotel’s own power generator, which meant that each one had electrical lighting and an air-fan, a rare luxury in those times. There were no water valves in the rooms but the guests could always take a bath because water was brought in on demand by servants assigned to the particular guest. But the crowning jewel of Raffles Hotel and yet more proof of Tigran’s business acumen was the exquisite dining. At the heart of their enterprise the brothers put food and everything that had to do with feeding and entertaining guests. It was obvious to Tigran that few travellers from Europe, however open they may be to gastronomical experiments, would risk their health dining at local establishments. Many guests had no adventurous streak at all, preferring the tried and true European cuisine. In the center of Singapore Tigran opened the Raffles Tiffin Room so his guests could get a second breakfast or lunch for free without having to return to the hotel. 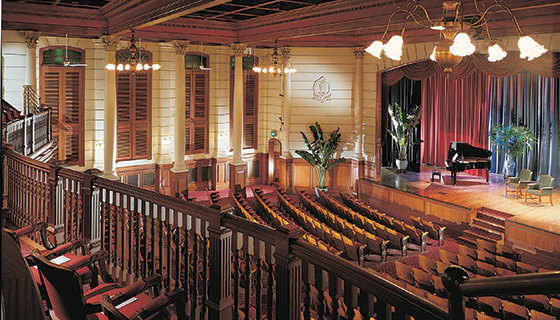 Raffles’ standing as the best hotel in Southeast Asia was reinforced when the owners opened a banquet hall that could sit 500 people. The restaurant had two French chefs and a cook responsible for the Asian menu. The 1913 edition of “Seaports of the Far East” claimed that the restaurant was the hotel’s “chief glory:” “Its handsome pillars, its white Carrara marble floor and the dainty artistic arrangement of its numerous tables form an ensemble unsurpassed outside Europe and America.” Indeed, Bohemian linen tablecloths and silver flatware drew no less attention than the contents of the menu (on Tigran’s personal orders, Raffles even had deliveries of black caviar). Up until the late 1920s Sarkies brothers’ business continued to grow. Raffles was in a constant state of renovation — the hotel acquired its own post office and bakery, a billiard hall, limousine rental and a huge ballroom that hosted the city’s greatest New Year balls and parties. 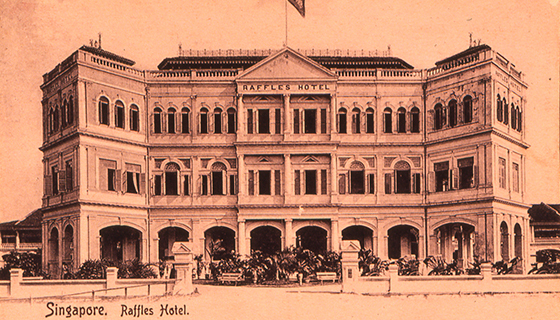 Raffles became the center of Singapore’s business and social life, an obligatory stop for any self-respecting traveler. But a global reputation failed to protect the Sarkies empire from turmoil, and its glory came to an end along with the deep economic crisis that followed the stock market crash of 1929. By this time, management of all of the hotels was left to the last and youngest brother, Arshak (Martin and Tigran died in 1912, Aviet — in 1923). Arshak was a gentleman with a penchant for expensive pastimes, not a businessman who knew how to get out of a bind. The situation was compounded by the brothers’ previous generosity, as they often allowed their most treasured guests to open a tab that wouldn’t get paid. These loans of trust nonetheless had a specific monetary value, and when the economic crisis hit Asia the Sarkies empire went bust. After Arshak’s death in 1931 Raffles was declared bankrupt and all of the brothers’ hotels in Southeast Asia came into the management company’s possession. The Sarkies era was over, but their principal creation — the Raffles Hotel — outlived its founders and still boasts exceptional service and famous guests. Except now they are unlikely to leave without paying.